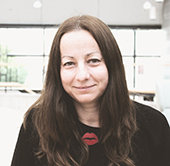 Violeta Roso is an Associate Professor at the Division of Service Management and Logistics. She has been researching on dry ports since 2003 and today is the leading researcher within the subject with numerous highly cited publications. The main idea behind the concept of dry port is improved seaport inland access that could generate benefits like increased seaport capacity and productivity, movement of goods from road to rail, lower environmental impact and regional development. Violeta has acted as a visiting academic at UNSW in Sydney, Australia; and at UNF, Florida, USA. She supervises PhD and master students, teaches master and postgraduate courses. The battle for the sea is won inland! There might be more projects where Violeta Roso participates, but you have to be logged in as a Chalmers employee to see them.